To make sure that everyone, which includes over 500 jewelry designers, is on the same page Lori has set up some ground rules. She pairs us up and we are required to send our partners a focal and a clasp which can't be a lobster claw. 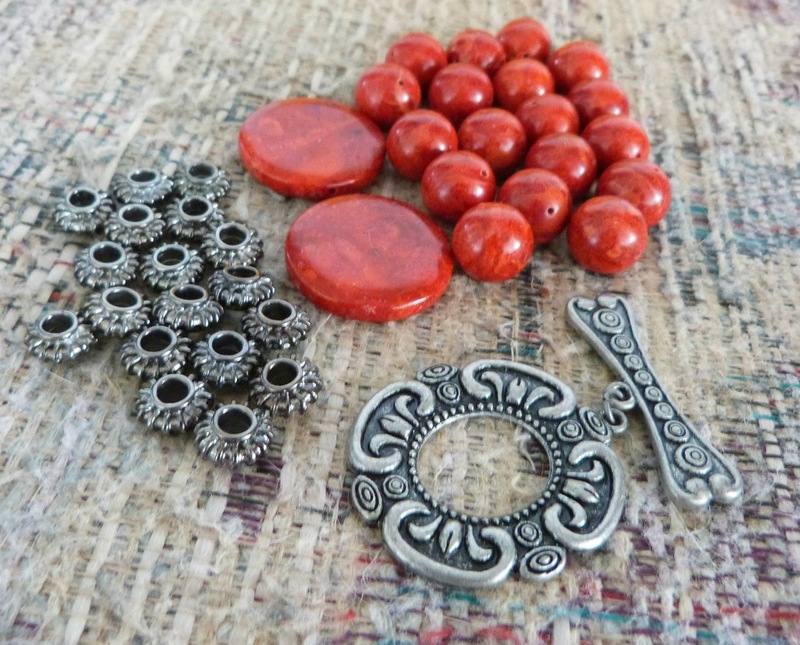 Most of us also send along some other beads and components that compliment the focal. Once we receive our 'soup' we then get to play and come up with some rather unique designs using the focal and clasp. I was lucky to end up with two partners for this reveal; Bonnie of Jasper's Gems and Laura of Blue Antiquities. They are both such wonderful woman and I have really enjoyed the opportunity to connect with them. Be sure to head over to their blogs to see what they have made with the goodies that I sent to them. Since I do have two partners this post is going to be a tad bit long so be forewarned. I am going to highlight Bonnie first as she was my first partner. Oh and let me apologize up front for my dress form. She is rather new to me and though she wears her years well, she really does need a turtleneck. But have you ever tried to find a turtleneck in the spring? Just a reminder of what Bonnie sent me. I have never worked with coral but I just love the colors and the properties of it. The coral is so rich that I felt really special. And there is that to die for clasp that I just couldn't hide. 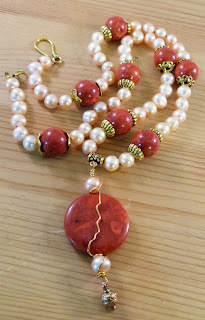 In this necklace, I used the coral focal and some of the matching beads from Bonnie. I added the freshwater pearls, the gold findings and the clasp. The pearls themselves are a pale apricot but for the life of me I couldn't get that to show up in the pictures. I have a friend that is having a lot of health issues and since coral is such a healing stone (for lack of a better word) I made her up a charm. I got the coral from my soup and I provided the turquoise goddess and the copper. And here is that wonderful clasp. In fact that was the only thing that I used from my bead soup for this necklace. I provided the chain, the crystals and the silk ribbon from my own stash. The button on the other side is from Marsha Neal Studios. And now onto my second partner, Laura. She certainly spoiled me with a lot of goodies including two focals that I could choose from. I was so excited that I forgot to take a picture so I borrowed this one off of Laura's blog. This has to be my favorite piece out of the batch. It is a longer necklace which is just my style. 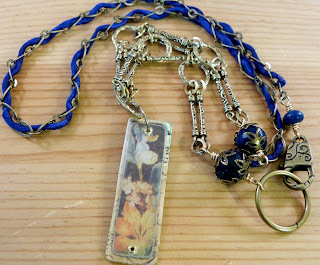 From the soup that Laura sent me, I used the focal, the brass ring and the faceted blue beads. I provided the chains, the silk ribbon and the clasp. The brass clasp that Laura sent just screamed Asian to me so I listened. 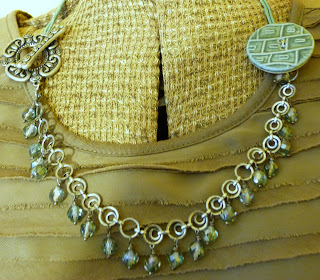 In this necklace I used the clasp and the beads from the soup. The rest came from my stash. I don't usually do yellow but what came to mind for this necklace was the fabulous paisley focal that I had won from Jewelry by Jeannie. I used the blue ceramic beads as well as the rolled paper ones from my soup. Everything else came from my stash. And last but not least is this pair of earrings. I love the look of ear wires that have beads on them so I decided that it was finally time to give it a try myself. The long aqua beads and the the oval ones are from Laura. The crystal, the enameled headpin from Sue Beads and the copper is from my own stash. I am also giving this pair of earrings away to one lucky person who comments on this post. Now be sure to check out what my partners cooked up as well as everyone else that participated. Just click here to be taken to the listing. Aren't you lucky! Two soups to play with! I love everything you've made. especially the charm, The second necklace with the clasp at the front and the oriental necklace. But really they are all wonderful. I would wear any of them.....just my style! Great job with both soups. I love the red coral necklace from the first soup and the focal Laura sent you is awesome. Love the necklace that you made with it. Lucky lady. Two soups to work with. Fantastic! I love all you made but honestly I love the earrings best! You had your work cut out for you with two soups and you did a beautiful job. it is hard to chose which is my favorite. 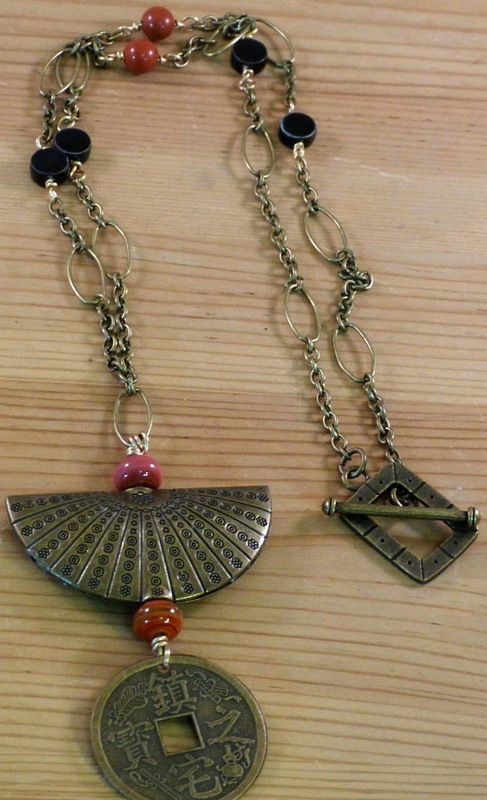 I love the "oriental" style necklaces but I really love the first one the best. But I really think my favorite is those earrings you are giving away. They are simply stunning. Two different soups to play with, how fun! You've made a good job, all the pieces are lovely. What an amazing job you did with BOTH of your soups...so many creative pieces, I'don't know which one I like BEST! LOVELY!!! I can barely handle one partner and you did a fantastic job with two:) I have to say that my favorite is the necklace that you created to showcase that first toggle. It's so pretty. I was away at an event all day and yours is the first page I'm checking out since I got home. I love the coral and pearl necklace! That is kind of how I envisioned the large focal being used. Great minds think alike. I love that you've used one of the coral beads to create a charm for your friend who is having health issues. Oh so pretty, all of them. The coral & pearl necklace is my favourite though. I love coral! I love everything you've done with your soup! Beautiful. 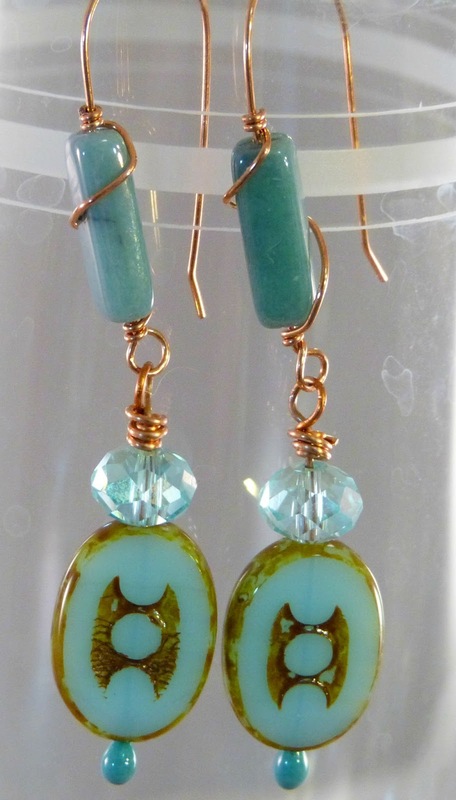 One of my favorites is the aqua earrings!! I just had my ears repierced after closing up years ago and I need earrings. Fingers crossed. Lucky you to have two soups to work from! I love the Asian inspired piece the best but they are all very beautiful! Great job! So cool you had two partners! What wonderful creations came from both soups! Awesome! I am blown away by your creations from both of your bead soups. I love that first necklace with the coral and the freshwater pearls just gorgeous. I have not tried using the beads on the earwires, but I do like how they look. So many beautiful pieces...the pendant is so thoughtful!!! oooo! prettiness!!! I love that first necklace (I love coral!) and those last turquoise earrings are quite nice too!!!! Wow, what a collection of great pieces. I love the Asian necklace, if I had to pick a favorite. Looks like two soups are better than one!! All of your pieces are great. I love the coral and pearl necklace. All of your pieces are lovely! My favourite is the pearl and coral, and the necklace with the Marsha Neal button. Oh my goodness, you made so many wonderful pieces with your soup! I think I like the longer necklace the best as well, but they all turned out lovely. Very nice! Wow! You have two very different soups and you've created beautiful pieces with them. I really like your coral necklace. Your coral necklace is so beautiful and elegant. I love that you paired the stones with pearls. I could see the apricot shade of the pearls. The whole piece is very feminine. I love it. Oh my, you were a busy bee! Great job! Lovely creative pieces. Great work! Beautiful jewelry! My favorite is the necklace with floral pendant and blue silk, the colors are just lovely. Lovely pieces, job well done!! 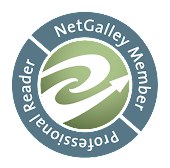 Thank you for your comment on my blog! Very pretty !! I love the blue necklace. Great job!! I love the contrast in design from the two soup mixes. All your work is very unique and very pretty. Lots of beautiful designs - I especially like those last earrings. You have made some absolutely fantastic jewellery, love the huge variation i the styles but the gorgeous silk ribbon and chain necklace is my absolute favourite piece. Wow - you were a busy soup chef for sure!! I'm not sure I can pick a favorite because they're all so unique and beautiful, but the red w/the pearls is super gorgeous!! You've worked a lot. I love your long necklaces: the blue one and the Asian-look one. Great work. Two soups! How lucky!! My partner sent me the same clasp that Bonnie sent you...you're right-it needs to be featured. Lovely work with everything! Wow! Your pieces are all lovely and so many! I like the dark blue piece best also. Nice job! Two soups - Wow! You did an amazing job with both soups!! So many lovely, vibrant pieces!! I thought I had seen your bead soup post, but I missed it somehow. What great soups. I love that first necklace with the pink. It's so vibrant.